Teacher Kazuyo Arai and her class listen to a student speaking at Honmoku Elementary School in Yokohama, south of Tokyo. Japan is adding about 1,200 pages to elementary school textbooks. TOKYO  When Mio Honzawa starts fifth grade next April, her textbooks will be thicker. Alarmed that its children are falling behind those in rivals such as South Korea and Hong Kong, Japan is adding about 1,200 pages to elementary school textbooks. The textbooks across all subjects for six years of elementary school now total about 4,900 pages, and will go up to nearly 6,100. 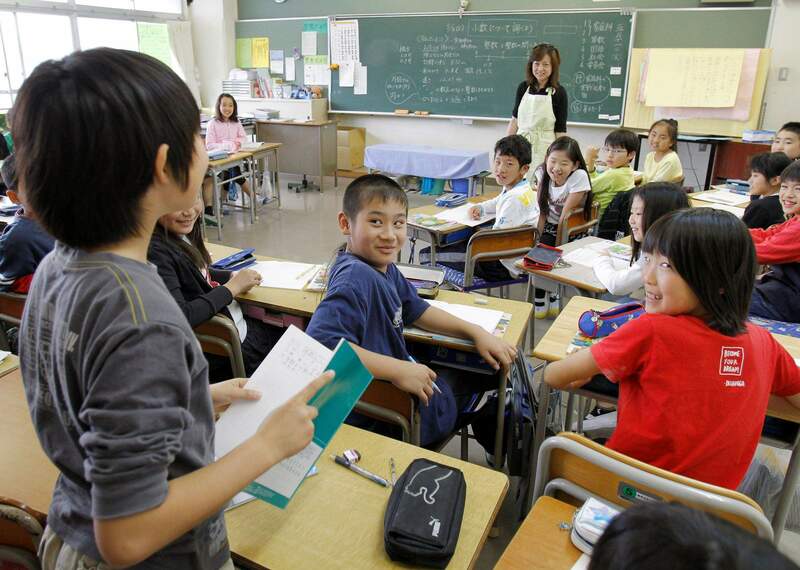 In a move that has divided educators and experts, Japan is going back to basics after a 10-year experiment in pressure-free education, which encouraged more application of knowledge and less rote memorization. I think its a good move. Compared to the education I got, Im kind of shocked at the level my children are receiving, said Keiko Honzawa, a Tokyo resident and mother of Mio and her seventh-grade brother. Japans near-the-top rank on international standardized tests has fallen, stunning this nation where education has long been a source of pride. The textbook debate mirrors one in the U.S., where new Common Core State Standards for math and English adopted by 37 states aim to strike a balance between teaching content and how to use that knowledge in everyday life and unify different state requirements. In both countries, sliding scores on tests such as the Programme for International Student Assessment, or PISA, given every three years to 15-year-olds around the world, have helped drive changes in educational guidelines. For Japan, the debate reflects a deeper anxiety as the country struggles to find direction in a world where its influence has waned. Its once-powerful  and now stagnant  economy has been overtaken by Chinas, and political leaders are grappling with how to deal with a bulging national deficit and an aging, shrinking population. Signs that Japans academic prowess is sliding have added to the consternation. Furthermore, the number of Japanese students studying abroad has fallen. Others see the revisions as misguided and believe the emphasis on independent thinking needed more time to bear fruit. Science and math textbooks will see the biggest additions, getting 60 percent more pages compared to earlier this decade. Among new concepts: Fifth-graders will learn how to calculate the area of a trapezoid and sixth-graders will learn about electricity. An hour or two of school will be added each week, depending on the grade, and English will be introduced in fifth grade instead of seventh. Middle and high school students can expect similar changes in subsequent years. Some fear this heralds a return to the cram education of the past that stressed memorization and was geared toward passing rigorous university entrance examinations. Though some colleges have introduced essay sections, they largely test ability to recall information, including finicky questions about English grammar that would baffle many native speakers. Tens of thousands of children attend private cram schools in the afternoons to get an extra edge for these exams. Getting into the right university goes a long way toward determining ones job, income level and place in society  a system that many Japanese agree needs to change. It was partly in reaction to criticism that the ministry of education about 10 years ago launched what popularly came to be called pressure-free education. The aim was to boost students skills in applying knowledge and expressing their own opinions, viewed as weaknesses in a system whose strengths have been in solving math problems and memorizing complicated kanji characters used in Japanese writing. Japans rank in math in the test, conducted by the Organization of Economic Cooperation and Development, dropped from first in 2000 to 10th in 2006, the most recent year for which results have been released. Science rankings slid from second to 6th, and reading comprehension declined from 8th to 15th. Japans performance in another test that does measure knowledge acquired in school, the Trends in International Mathematics and Science Study, or TIMSS, has been mixed. Middle school students rank in math has slipped from 3rd in 1995 to 5th in 2007, while their rank in science, which fell from 3rd to 6th in 2003, improved to 3rd again in 2007. The current system has been a huge failure, said Eiichi Kajita, president of International Pacific University, who helped craft the new curriculum guidelines. Education has become too child-centered, he argued. Mutsuko Takahashi, vice president of the Japan Teachers Union, says teachers didnt get enough training on how to carry out the programs goals  something education ministry officials acknowledge. For their part, education ministry officials say the new guidelines are meant to better balance teaching fundamentals with promoting creative, independent thinking.